Oceans may be acidifying faster today than in the last 300 million years. : Photograph courtesy of NOAAThe oceans may be acidifying faster today than they did in the last 300 million years, according to scientists publishing a paper this week in the journal Science. "What we're doing today really stands out in the geologic record," says lead author Bärbel Hönisch, a paleoceanographer at Columbia University's Lamont-Doherty Earth Observatory. 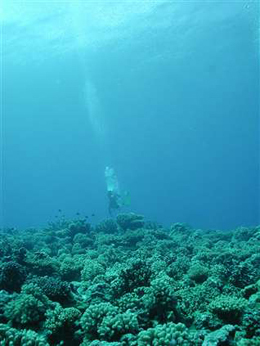 Marine scientists study how corals and other species respond to more acid seas. 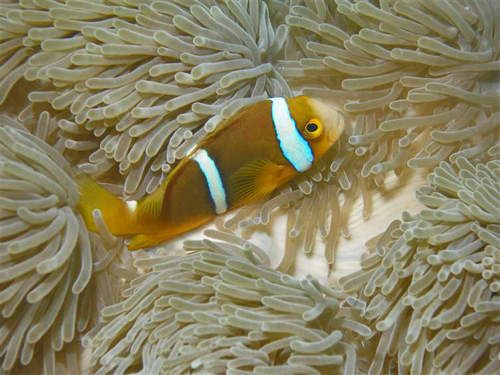 : Photograph courtesy of NSF Moorea Coral Reef Long-Term Ecological Research Site"We know that life during past ocean acidification events was not wiped out--new species evolved to replace those that died off. But if industrial carbon emissions continue at the current pace, we may lose organisms we care about--coral reefs, oysters, salmon." The oceans act like a sponge to draw down excess carbon dioxide from the air. The gas reacts with seawater to form carbonic acid, which over time is neutralized by fossil carbonate shells on the seafloor. If too much carbon dioxide enters the ocean too quickly, it can deplete the carbonate ions that corals, mollusks and some plankton need for reef and shell-building. In a review of hundreds of paleoceanographic studies, the researchers found evidence for only one period in the last 300 million years when the oceans changed as fast as today: the Paleocene-Eocene Thermal Maximum, or PETM. In ocean sediment cores, the PETM appears as a brown mud layer flanked by thick deposits of white plankton fossils. 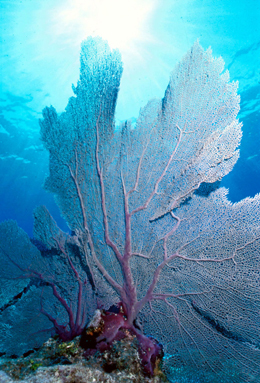 The common sea fan is but one of the species being affected by acidifying oceans. : Photograph courtesy of NOAAAbout 56 million years ago, a mysterious surge of carbon into the atmosphere warmed the planet and turned the oceans corrosive. In about 5,000 years, atmospheric carbon doubled to 1,800 parts per million (ppm), and average global temperatures rose by about 6 degrees Celsius. The carbonate plankton shells littering the seafloor dissolved, leaving the brown clay layer that scientists see in sediment cores today. As many as half of all species of benthic foraminifera, a group of one-celled organisms that live at the ocean bottom, went extinct, suggesting that deep-sea organisms higher on the food chain may have also disappeared, said paper co-author Ellen Thomas, a paleoceanographer at Yale University. "It's really unusual that you lose more than 5 to 10 percent of species," she said. Scientists estimate that ocean acidity--its pH--may have fallen as much as 0.45 units as the planet vented stores of carbon into the air. "These scientists have synthesized and evaluated evidence far back in Earth's history," said Candace Major, program officer in the National Science Foundation's (NSF) Division of Ocean Sciences, which funded the research. "The ocean acidification we're seeing today is unprecedented," said Major, "even when viewed through the lens of the past 300 million years, a result of the very fast rates at which we're changing the chemistry of the atmosphere and oceans." In the last hundred years, rising carbon dioxide from human activities has lowered ocean pH by 0.1 unit, an acidification rate at least 10 times faster than 56 million years ago, says Hönisch. The Intergovernmental Panel on Climate Change (IPCC) predicts that pH will fall another 0.2 units by 2100, raising the possibility that we may soon see ocean changes similar to those observed during the PETM. More catastrophic events have happened on Earth before, but perhaps not as quickly. The study finds two other analogs for modern day ocean acidification--the extinctions triggered by massive volcanism at the end of the Permian and Triassic eras, about 252 million and 201 million years ago, respectively. But the authors caution that because ocean sediments older than 180 million years have been recycled back into the deep Earth, scientists have fewer records to work with. During the "Great Dying" at the end of the Permian, about 252 million years ago, about 96 percent of life disappeared. Massive eruptions from what is known as the Siberian Traps in present-day Russia are thought to have triggered earth's biggest extinction. Over 20,000 years or more, carbon in the atmosphere rose dramatically. Scientists have found evidence for ocean dead zones, and preferential survival of organisms predisposed to carbonate-poor seawater and high blood-carbon levels, but so far they have been unable to reconstruct changes in ocean pH or carbonate. At the end of the Triassic, about 201 million years ago, a second burst of mass volcanism associated with the break-up of the supercontinent Pangaea doubled atmospheric carbon and touched off another wave of die-offs. 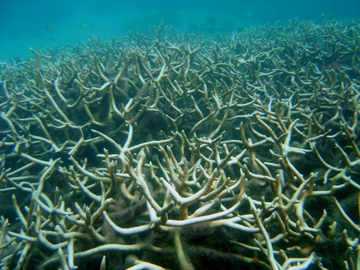 Coral reefs in the tropics and beyond are threatened by acidifying oceans. : Photograph courtesy of NOAACoral reefs collapsed and an entire class of sea creatures, the eel-like conodonts, vanished. On land, large plant-eating animals gave rise to meat-eating dinosaurs like Tyrannosaurus rex as the Jurassic era began. A greater extinction of tropical species has led some scientists to question whether global warming rather than ocean acidification was the main killer at this time. This study finds that the most notorious of all extinctions, the one that ended the Age of Dinosaurs with a falling asteroid 65 million years ago, may not have been associated with ocean acidification. The asteroid impact in what is today known as Mexico 65 million years ago released toxic gases and possibly set off fires that sent surges of carbon into the air. 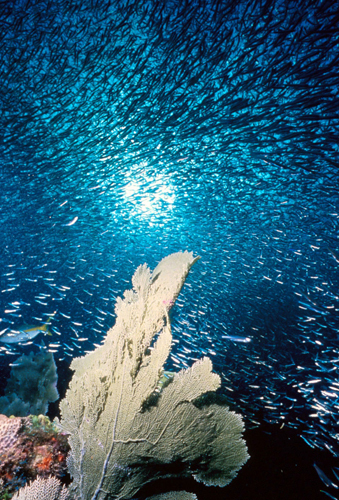 Though many species of plankton went extinct, coral reefs and benthic foraminifera survived. In lab experiments, scientists have tried to simulate modern ocean acidification, but the number of variables currently at play--high carbon dioxide and warmer temperatures, and reduced ocean pH and dissolved oxygen levels--make predictions difficult. An alternative to investigating the paleo-record has been to study natural carbon seeps from offshore volcanoes that are producing the acidification levels expected by the year 2100. 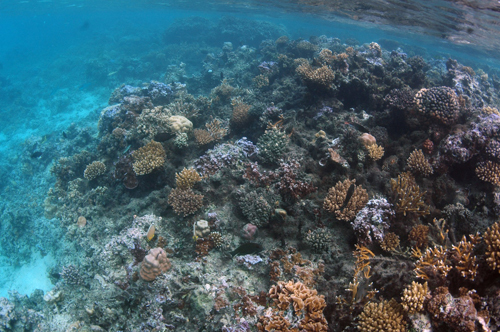 In a recent study of coral reefs off Papua New Guinea, scientists found that during long-term exposure to high carbon dioxide and pH 0.2 units lower than today--at a pH of 7.8 (the IPCC projection for 2100)--reef biodiversity and regeneration suffered. This article is from The National Science Foundation (NSF), 1 March 2012. Cooperating for Clean Air: a Horizon International Swedish TV2 co-production, with the assistance of Polish Television. Part 1 of the television program One Second Before Sunrise Program II, broadcast nationwide in the US on PBS, in Europe and in many other parts of the world. This program provides the background of problems causing global climate change and acid rain and solutions. The program presents successful initiatives including energy efficiency, solar, wind power generation, mini-hydropower, biogas from garbage, and others; from a power plant clean enough to be in the heart of Stockholm to solar villages near the Arctic Circle. Host and Narrator: Lynn Redgrave, Sweden Co-Host: Johan Forssblad. Executive Producer, Producer, Director Janine Selendy. Videographer Anders Carlsson, Sound Engineer Klas Karlsson, Editor Béla Selendy and many others. Horizon's Solutions Site at www.solutionssite.org presents Global Climate Change initiatives and welcomes submissions of solutions for possible inclusion. Horizon International A.K.A. Horizon Communications at the time of this production. La cooperación para el Aire Limpio: un horizonte internacional sueco TV2 co-producción, con la ayuda de la televisión polaca. Parte 1 del programa de televisión un segundo antes de amanecer el Programa II, transmitido a nivel nacional en los EE.UU. en la cadena PBS, en Europa y en muchas otras partes del mundo. Este programa proporciona el fondo de los problemas que causan el cambio climático global y la lluvia ácida y las soluciones. El programa presenta las iniciativas exitosas como la eficiencia energética, la energía solar, la generación de energía eólica, mini hidroeléctrica, el biogás de la basura, y otros, desde una planta de energía limpia suficiente para estar en el corazón de Estocolmo a las aldeas solares cerca del Círculo Polar Ártico. Las actualizaciones están disponibles en el sitio de Soluciones de www.solutionssite.org Horizon. Anfitrión y Narrador: Lynn Redgrave, Suecia Co-Host: Johan Forssblad. Productor Ejecutivo, Productor, Director Janine Selendy. Videógrafo Anders Carlsson, Ingeniero de Sonido Klas Karlsson, Editor de Béla Selendy y muchos otros. Sitio Horizon Solutions en www.solutionssite.org presenta iniciativas globales sobre el cambio climático y la invita a la presentación de soluciones para su posible inclusión. La segunda parte de este programa de segundo antes de amanecer es arañas Ayuda agricultores cultivan más seguros los cultivos. Las arañas Ayuda agricultores cultivan más seguras Cultivos te lleva de Harbin, en el norte de China en Wuhan en el río Yangtsé y en el Valle de San Joaquín en California. El uso innovador del Dr. Zhao Jing Zhao a las arañas para controlar las plagas del algodón en la República Popular de China demuestra el papel importante de manejo integrado de plagas como un medio para reducir el uso de productos químicos nocivos y aumentar la productividad agrícola. Los cultivadores de algodón en Hubei han aumentado sus rendimientos, mientras que la reducción del uso de pesticidas en un 70-90%. En California, el anfitrión Lynn Redgrave habla sobre manejo integrado de plagas con un experto local en los campos de algodón del Valle de San Joaquín. Las arañas son la protección contra los depredadores de algodón en los campos de Wuhan, mientras delicadas alas de encaje verde son la protección de algodón en los campos de California. Las arañas Ayuda agricultores cultivan más seguros los cultivos es un horizonte internacional co-producción con Hei Long Jiang Televisión de la República Popular de China. Este programa tuvo su primera emisión a nivel nacional por PBS en los Estados Unidos y en China en 1993. Janine Selendy es productor ejecutivo, co-productor y director. Organizado y narrado por Lynn Redgrave. Roger P. Swain, Ph.D., Editor de Ciencia Antigua, la revista Horticultura y miembro del Horizonte Científico Internacional de la Junta de Revisión fue el de asesor y fuera de sitio. La música es de Joe Mennona. Créditos adicionales de producción son al final del programa. Otros programas de Horizon TV se puede ver en YouTube y en www.horizoninternationaltv.org. Características horizonte internacional los artículos, estudios de casos y exposiciones sobre el sitio de Soluciones de Horizon www.solutions-site.org y en él los océanos y corales www.magicporthole.org sitio web de los arrecifes. Horizonte invita a la presentación de soluciones para su posible inclusión. Horizon Internacional era alias Comunicaciones horizonte en el momento de esta producción.